Onawa Merchant Shoots When Crook Orders Him To Throw Up His Hands. Onawa, Ia., Aug. 13. — I.A. Blotcky, a local merchant, shot and killed a highwayman almost at the door of his home here at 10:30 o’clock Saturday evening. 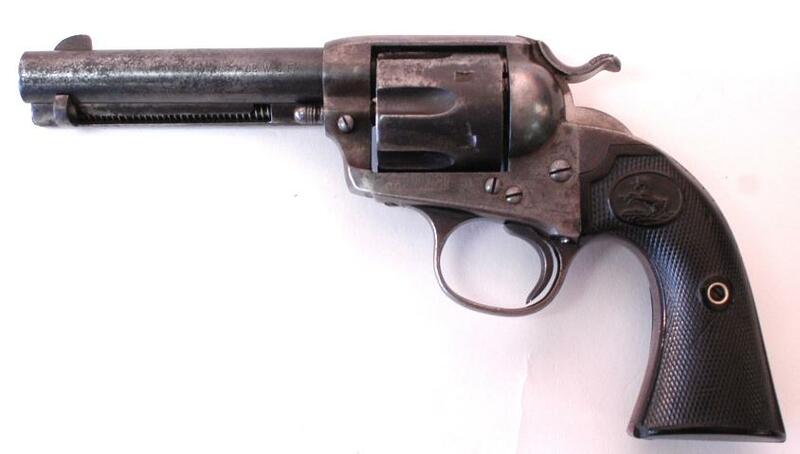 Mr. Blotcky had for some time made it a practice to carry Saturday’s cash receipts home with him in a sack, invariably holding a loaded .32 calibre revolver just under his coat in the other hand. At the time of the shooting he carried $1,200 in a bag. Just as he was turning into his lawn, a man stepped out from behind a tree commanding Blotcky to throw up his hands. As he raised his hands, as if in compliance, Mr. Blotcky fired and the robber fell, the bullet having taken effect in the left eyeball and passed through his brain. The unknown man died in half an hour. After the shooting, Blotcky informed Sheriff George Martin. The would-be robber had been seen hanging around town for several days before the shooting. He had been with two companions and pretended to be seeking work in the harvest fields. J.B. Richard and Gus Danielson, of the Sioux City detective force, have been here and procured pictures of the dead man in the hope of establishing his identity, no papers having been found in his pockets. Detective Richard found $50 in bills in a secret pocket. Mr. Blotcky has been exonerated by a coroner’s jury. His father, Joseph Blotcky, of Sioux City, was here yesterday. 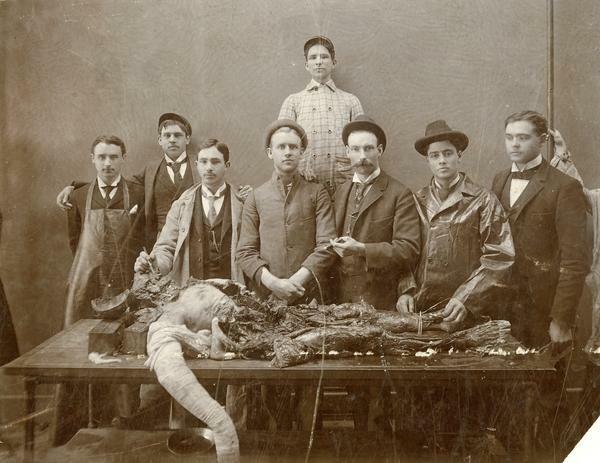 Young doctors working in the cause of science, now cut to bits all that is left mortal of the robber who was shot last week at Onawa when he attempted to hold up I.A. Blotcky, who carried $200. Society may be better off without him, as the papers say, but just the same, somewhere probably a mother is standing at the back gate watching the train’s arrival to bring home her wandering son. The best method to prevent houseflies from breeding is to observe strict cleanliness in the homes and on the streets. This method was successfully carried out along the Panama canal in the campaign against malaria and yellow fever, which are conveyed from one person to another by mosquitoes. Don’t give the deadly fly a chance! 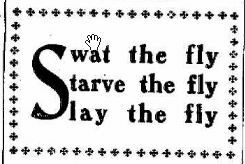 Keep the house free of food for flies! Smite Him Hip and Thigh. Is left to make a cry. And run up doctor’s bills. Will bid the world goodby. Practice It and You’ll Save Many a Life. WHERE does the fly live? Where there is filth. Is there anything too filthy for the fly to eat? No. Does the fly like clean food too? Yes, and it appears to be his delight to wipe his feet on clean food. Where is his favorite place of feeding? The manure heap and the garbage can. Where does the fly go after leaving the manure pile and garbage can? Into the kitchen, dining room and bedroom. 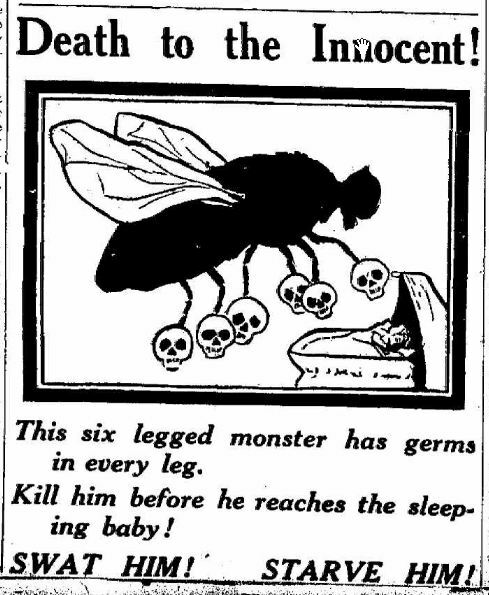 Does the fly visit those sick with typhoid fever, consumption, smallpox and cholera infantum? He certainly does and may call on you next. Is the fly dangerous? Yes; he spreads disease. How does he spread disease? By carrying infection on his legs and wings and by “fly specks” after he has been feeding on infectious material. 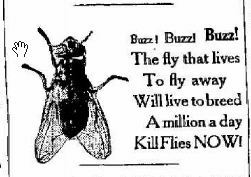 Did the fly ever kill any one? He killed more American soldiers in the Spanish-American war than the bullets of the Spaniards and was the direct cause of much of the typhoid fever in this country last year. 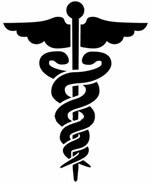 Where are the greatest number of cases of typhoid fever and summer complaint? Where there are the most flies. Where are the most flies? Where there is most filth. Is the presence of flies, therefore, an indication of nearby filth? It most certainly is, and that is disgraceful. How may we successfully fight the fly? By destroying or removing his breeding place, the manure pile; removing all garbage and making vaults flyproof and by keeping our yard and alley clean, by screening the house and by the use of the wire swatter and sticky fly paper. That fly on your plate didn’t wipe his feet when he came in. The chances are his last walk was in the filth of the street or the garbage pail. 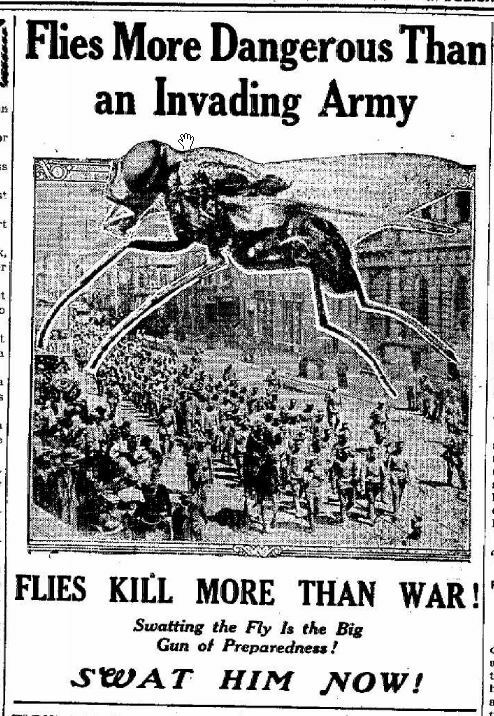 Then why put up with flies? Keep flies out of your home. Don’t trade at stores that tolerate flies. WHEN your children are out of doors and awake the fly is not so dangerous. You will very rarely see a fly on the face of a child walking or playing, but if your baby sleeps outdoors that is the danger time. He must be carefully covered with mosquito netting to protect him from the poisoned kiss. Swat that buzzer good and hard! Steel your heart, though mercy pleads. 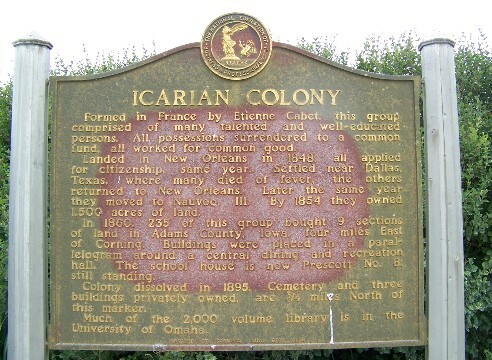 Right where Mary wore the beads! To abate this insect pest. Swat him while the swatting’s good! STARVING the fly was added to the swatting of it in Paterson, N.J. The board of health set apart a day for householders to wrap up their food so that the housefly will fail of sustenance. It was even asked that all refuse food be well wrapped before it is put in the garbage cans. 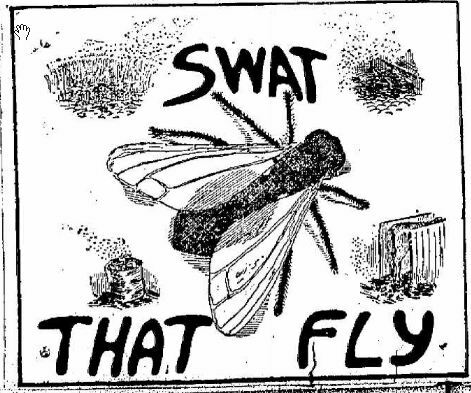 In addition, every one of the 125,000 residents who was able to swat was asked to kill 200 flies. 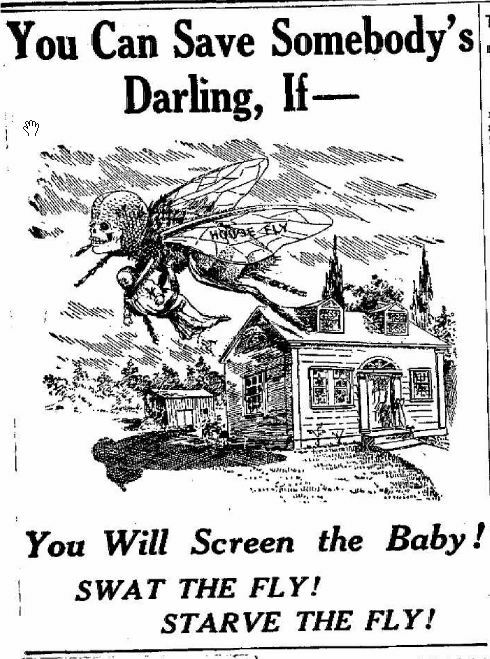 Flies and dirt double the amount of sickness among New York city’s babies. This statement, made public by the department of social welfare of the New York Association For Improving the Condition of the Poor, is based on a two years’ investigation in more than a thousand families. Don’t let that fly get away! If you were to walk into a room and then be told that in it there were 7,000,000 chances of catching a deadly disease, how long would you linger? The chances are 100 to 1 that you would get out as quickly as possible. According to scientists and doctors, a fly may carry as many as 7,000,000 germs on its feet. Typhoid and tuberculosis are the most common of these germs. When we dwell on the great war in Europe words fail us. Yet statistics show that disease transmitted by the housefly kills more than armies! Short Sketch of Adams County Citizens of Advanced Age. A Resident of Adams County for Fifty Years, This Good Woman Has Seen Many Changes. Mrs. Sarah Roberts, whose picture we give below, was born in Jefferson county, Ohio, August 3, 1819, and is therefore a trifle under 90 years of age. She was the daughter of Pamela J. and Arnold Inman, and at the age of 12 years moved with her parents to Washington county, near the town of Marietta, on the Ohio river. Here she grew to womanhood, amid the privations of pioneers in a timber country. On September 20, 1839, she was married to Daniel Roberts, in Muskingham county, Ohio, where they resided until 1850, when they removed to Henry county, Illinois, locating on the prairie near where the town of Kewanee now stands. Here they resided for two years, and then returned to Ohio, remaining in Muskingham county until August, 1959, when in company with Messrs. Alfred and John White, Mr. and Mrs. Roberts started overland in covered wagons for Adams county, Iowa, arriving in Quincy the latter part of October. Mr. Roberts rented a log cabin of Zachariah Lawrence and moved into it for the winter. This cabin stood on the prairie north of Carbon, near where the Houck school house now stands, and was twelve by fourteen feet in size. The Roberts family, being acquainted with the Lawrences and the Registers, old settlers in this county who had preceded them from Ohio to Iowa, enjoyed the winter very much, notwithstanding the hardships of a new country. In the spring of 1860 the Roberts family moved to the Sprague farm, now owned by C.A. Foote, and here they had a log cabin with a fire place and a sod chimney to do cooking. 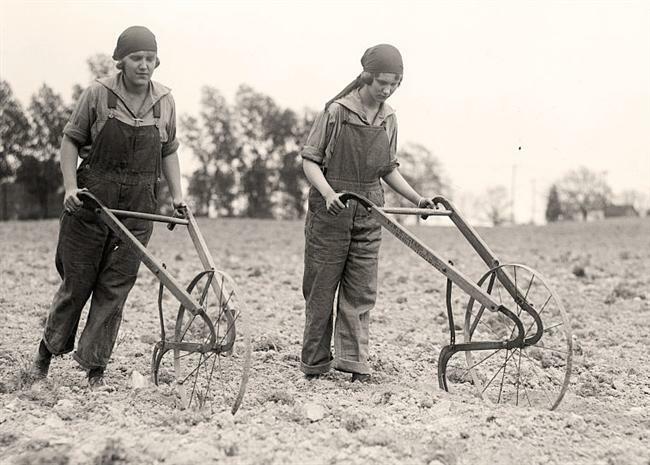 Mrs. Roberts remembers that they went with one of their neighbors to Des Moines to secure a plow to till Iowa soil, Des Moines being about the nearest point where a plow might be secured in those days. In the spring of 1861 Mr. Roberts moved to Mt. Etna, at that time a thriving metropolis with three frame buildings and two cabins. In the same year, he purchased some Adams county soil of Morgan Warren, the purchase price being $5 per acre, and in part payment Mr. Roberts traded a land warrant issued soldiers of the Mexican war. There are many other interesting incidents that have occurred in the life of this good woman that would be very entertaining to our readers, if we but had space to tell of them. Of the Inman family, to which Mrs. Roberts belonged, there are now living beside the subject of this sketch, Mrs. Marguerite Thompson, of Corning, aged 83 years; Hamilton Inman, Bigelow, Kansas, aged 78; Felix R. Inman, Antler, North Dakota, aged 73. Mrs. Polly Carlow, of Gross, Nebraska, died only a short time ago and her remains were brought to this city for interment, as our readers will remember. Of the immediate family of Mrs. Roberts, two sons are living, W.W., of Gove county, Kansas, and L.D. Roberts, residing near Mt. Etna, with whom Grandma Roberts makes her home. Her husband died about 20 years ago. Chicago, Feb. 13 — Christian K. Nelson came to Chicago from Omaha 15 months ago with 19 cents and an idea. Today the 19 cents has grown to a steadily increasing fortune of six figures. It’ll be well over a million before Nelson pays his income tax. Nelson’s idea was to cover a square of cold ice cream with a layer of hot chocolate, thus caking a confection with real ice cream inside. He got that idea while he was managing his father’s ice cream plant out in Onawa, Ia. And he furthered it while he was studying chemistry at college. When he was graduated he peddled the idea around from ice cream factory to ice cream factory. Everybody laughed at him. “Cover cold ice cream with hot chocolate? Man; you’re crazy!” they’d say. 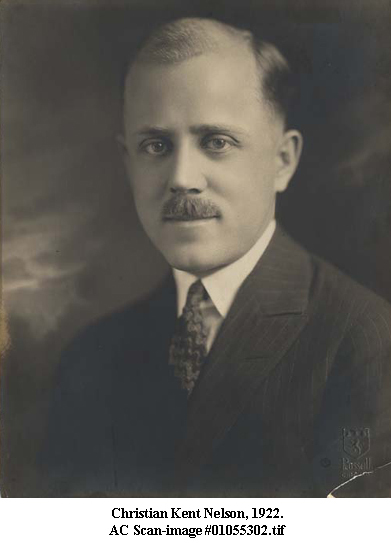 But Russell Stover, manager of an ice cream plant at Omaha, was different. He thought Nelson’s idea could be put over. And together Stover and Nelson did put it over. That’s why you see a big yellow sign advertising “Eskimo Pie” in your confectionery store window. 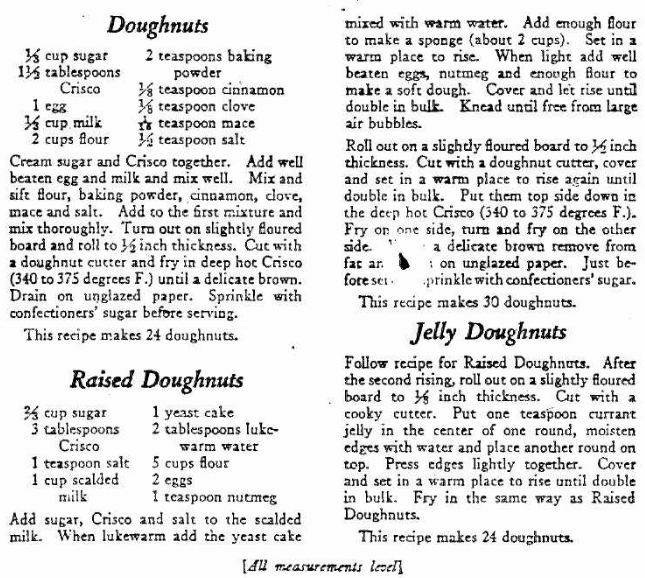 For Nelson’s the inventor of Eskimo Pie. Nelson’s not making it. 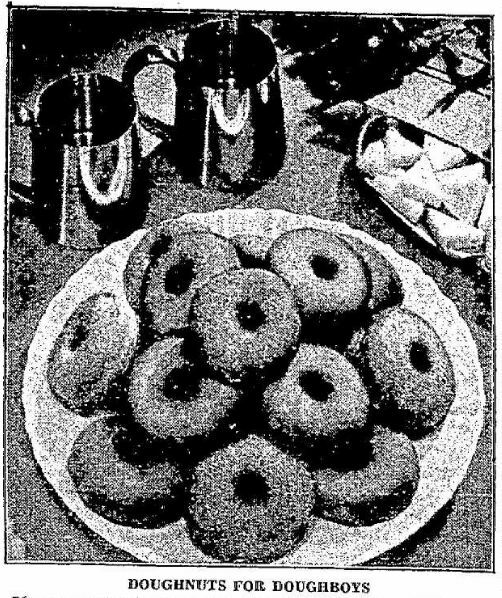 His company, composed of himself, Stover and others, is selling licenses to firms in other cities to manufacture the confection. 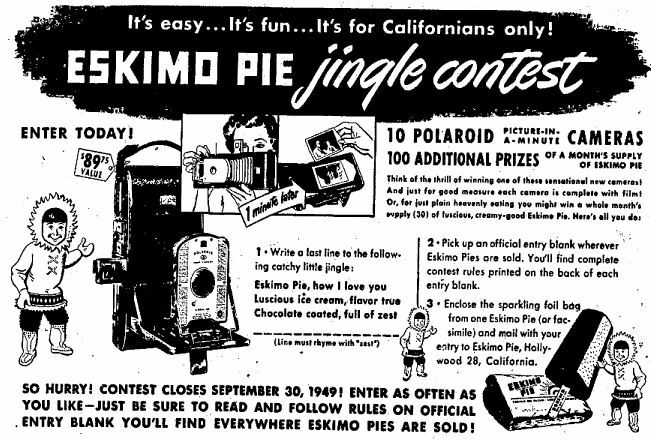 Today there are more than 1,000,000 Eskimo pies eaten daily. And Nelson’s company gets 5 cents royalty on every dozen pies. And Nelson’s busy with an adding machine trying to figure up his income. “Don’t lose heart,” Nelson advises others. “I kept at my hunch and plugged — that’ why I succeeded. 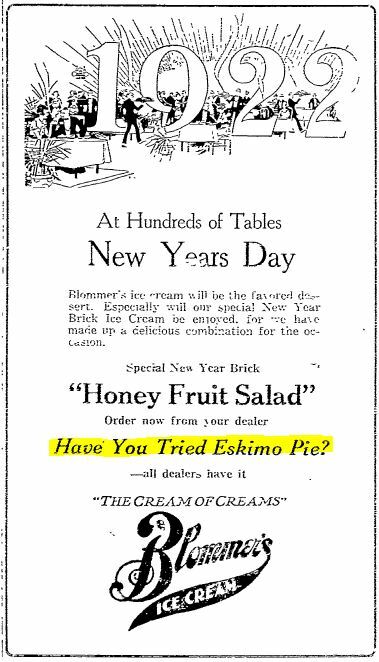 “Eskimo Pie”, now figuratively and almost literally, in “everybody’s mouth,” promises to make a near-millionaire, if not a real one, out of a Johnson county boy. 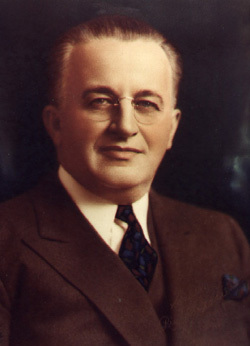 Russell Stover, the inventor of the chocolate and ice cream confection that bears that name, is a son of Mr. John R. Stover, a prominent Johnson county farmer, who lives one mile west of Indian Lookout, where the young candy man, who is heading the Russell Stover company of Chicago, was born. 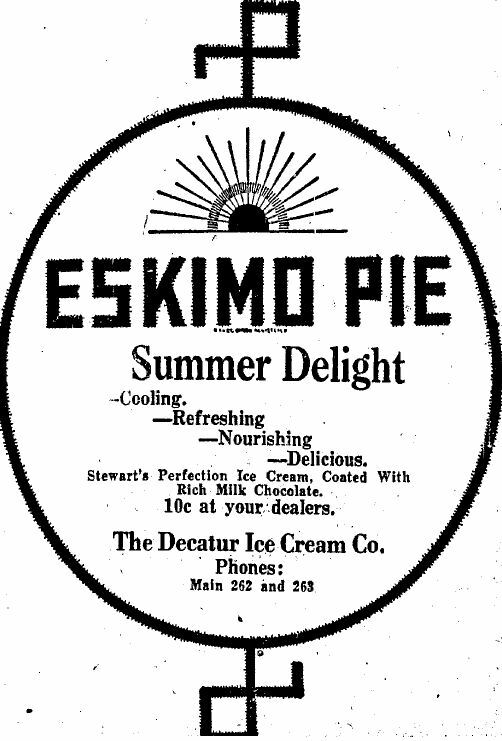 The “Eskimo pie” is destined to enrich the Iowa City and S.U.I. boy of other days, is indicated strongly by a letter Mr. Stover received from his son today. The inventor is traveling, far and near, putting in 18 hours a day, licensing manufacturers to produce his confection. He has more than 250 on the list now, and more than 40,000 retail stores are handling the article already. 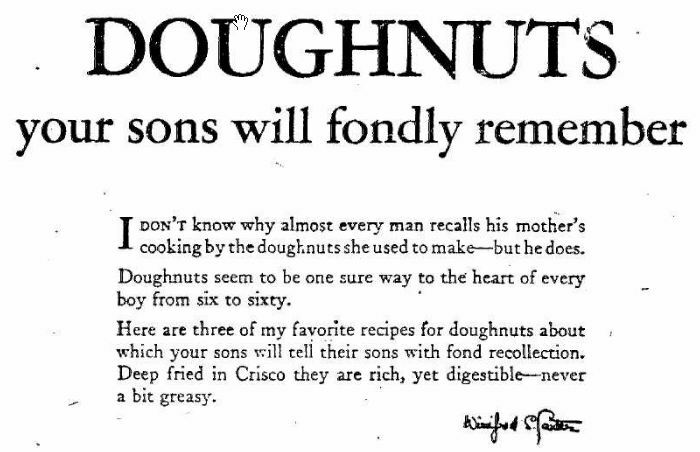 He predicts a sale of 2,000,000 a day, and the Stover company will get 5 cents a dozen royalty, he writes, on these. This spells $3,000,000 a year for the Iowa Citian and his associates. Plans are making to ship to China, Japan, and all parts of Europe. Mr. Stover has been called to New York and New Haven, Conn., this week, to address conventions of manufacturers. His traveling secretary is General Leonard Wood’s presidential campaign secretary, Fugitt, who declares the “Eskimo” campaign is more exciting than the political fight. Some big lawsuits may follow, as the company alleges imitators and infringers are busy violating the Stover copyrights and patents. Test suits will be instituted in the metropolises. Some figures are of interest in connection with the Iowa City man’s business campaign. The company telephone bill — before breakfast — in a single day, is $160. The advertising bills are enormous. A contract for a double page in Saturday Evening Post, in February calls for $14,000. CHICAGO — (Special) — Anybody’d think dipping ice cream into hot chocolate would melt the ice cream. 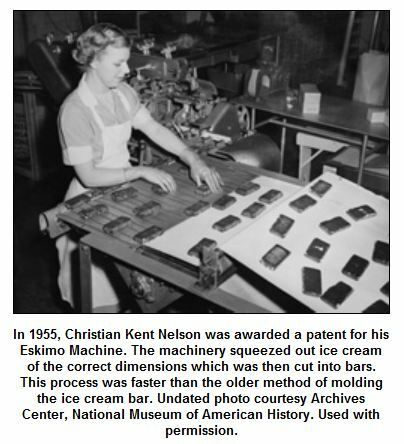 Christian Kent Nelson discovered the way to do it, however, at just the right temperature. The result — eskimo pie. 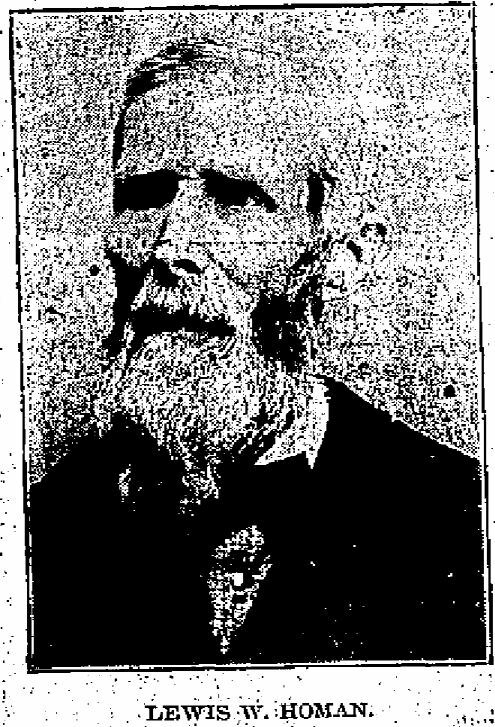 Until he made his discovery Nelson was a poor but contented teacher at Onawa, Ia. Today money’s pouring in on him so fast that he’s scared. “I want to stay human,” he says. He tried hard enough to market his idea before it “caught on.” Most people he approached were skeptical. Finally Russell Stover of Omaha went in with him. From that moment the golden tide began to rise. For Nelson, at any rate, it rose too high. “Money! The more I see of it, the less I like it. I’d rather be with my books, or back on the job as teacher again,” he exclaims. He hasn’t even bought an automobile. 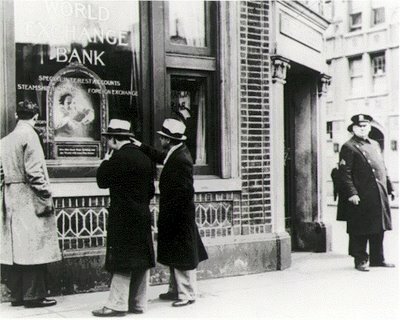 Perhaps wealth came a bit too fast — about a year, from a shoe-string to affluence is sudden enough to be disconcerting. Nelson’s a graduate of Nevada University. He’s only 29. His father and mother are living and he has brothers and sisters. He’s unmarried. When a reporter asked him, “Do you intend to take a wife?” “Maybe,” he answered. 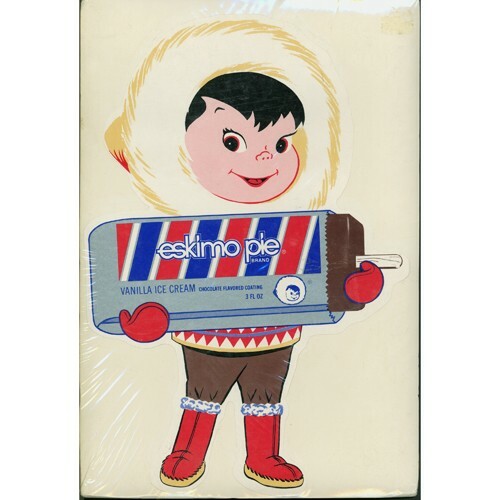 A native Chinese might be amazed at the sight of chop suey as it is known in America, but probably no more than an Eskimo on seeing his first Eskimo pie. The more people you assist or entertain, the greater your income. Often you comment along these lines: Einstein, a super-scientist of the sort that appears only once in centuries, makes less money than the inventor of some trifling thing like the Eskimo pie, ice cream cone or safety pin. The answer to this is that Einstein serves only a small and limited number of customers — scientists — while the other inventors serve millions, each contributing his mite to the inventor. In any scheme to get rich, don’t forget the importance of doing something that will serve a great multitude. 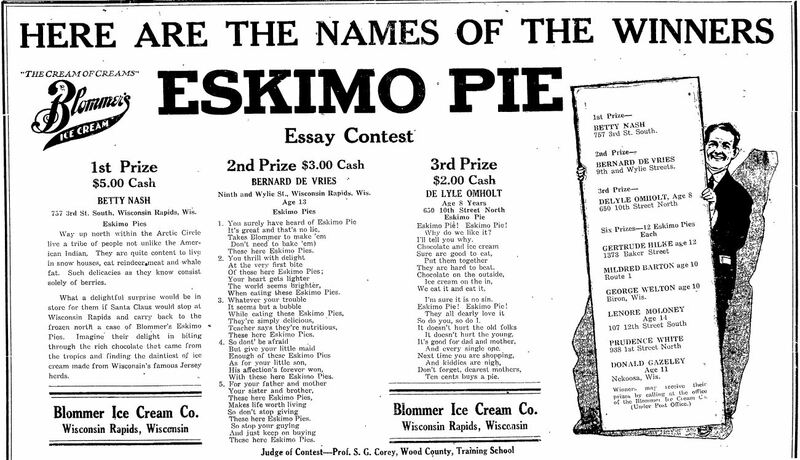 A highbrow is a person who wants his Eskimo pie a la mode. NEW YORK, Aug. 17. — Aggie Kelley, aged 14, was advised to go back to her father and stay with him by Recorder Kane in Bayonne, N.J., today, when she was brought before him. Policeman Bonlin found the girl yesterday sitting on a curbstone crying. She told the recorder she had a good home with her father on a canal boat and she wanted to go there as quickly as she could. And chew on other lightish lunches. But Gawd forgive the combination. Whose checkered vest has spots of soup? He hold the power of life and death! Look him o’er — the local Kleagle! (‘Twas made for some less portly wight). The Law, he doth expectorate. He breaks a city ordinance. ‘Til oft’ as late as half-past ten. LEWIS W. HOMAN, MT. ETNA. One of the Early Pioneers in Iowa, an Ex-County Judge and an Exemplary Citizen. Lewis W. Homan, the subject of this sketch, was born January 26, 1818, and is now 91 years old. His father and mother were citizens of Virginia at the time of their marriage, in 1816, but soon after moved into Kentucky. Mark Homan, father of Lewis W., was born in Virginia near the Potomac river, about 40 miles above the city of Washington, in the year 1789, the year that George Washington was first elected president. When Mark Homan was 13 years old he moved with his mother to what is now West Virginia, where he lived until he attained the age of 27 years, and where he met and married Miss Nancy Burson, in 1816. Soon after their marriage they moved across the Cumberland mountains into Kentucky, crossing the mountains on horseback. In 1818 their son, Lewis W., whose picture we this week present to our readers, was born, on the banks of Salt river, in Kentucky. When Lewis was about eight years old his grandmother, Elizabeth Homan, entered land in Putnam county, Indiana, which she deeded to her son Mark, and to which Lewis W. came with his father and mother in the fall of 1827, and where his father made his home until the time of his death in 1874, the mother dying in 1837. Here Lewis grew to manhood and in 1838 was married to Miss Temperance M. McClain. 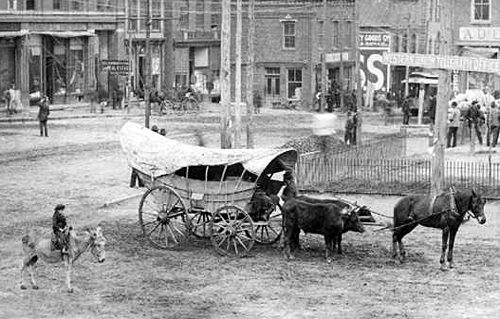 In 1843 with his wife and three children he moved to Jones county, Iowa, coming through from Indiana with an ox team and in the old fashioned prairie schooner. Jones county was then mostly unfenced, raw prairie, and its county seat was but a very small village. However, its people were open hearted and kind to all newcomers, and the family was soon among kind and sociable friends. 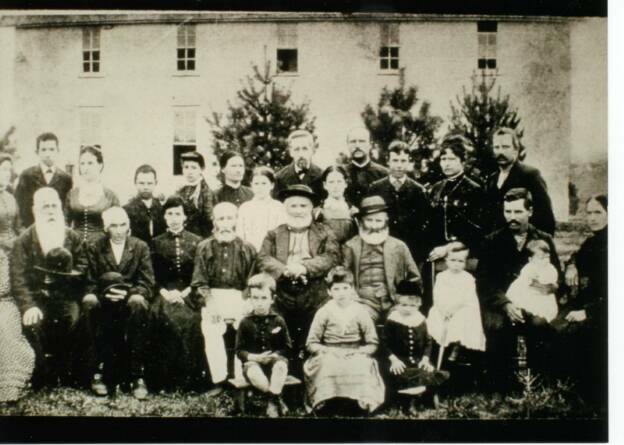 They resided in Jones county until the year 1856, when they came to Adams county, where they again went through the experiences of making a home on the frontier of a new country. It was not long, however, until they were surrounded with friends and helpful neighbors, and the exemplary life of the old gentleman has retained the respect and esteem of all his acquaintances down through the years. Mr. Homan was married but once, his wife living with him to old age. At the time of her death, about eight years ago, they had been living together 63 years. On the occasion of their fifty-seventh wedding anniversary a large number of their relatives and friends met to assist in celebrating the event. Mr. and Mrs. Homan were the parents of 12 children and number among their progeny 51 grandchildren, most of whom are living, and 44 great grandchildren, a record that scarcely finds an equal in Adams county. Lewis Homan and wife passed a few years in Corning, the rest of their lives they spent on the farm, where they raised their large family. Under the old law, Mr. Homan served a term as county judge of Adams county, and thus it will be seen that his friends and neighbors delighted to honor him with a high position in their midst. He and his brother Westley were the founders of the First Baptist church of Adams county, which was organized in 1858, and of which he is the only charter member. It stands as a splendid monument to his religious zeal and fidelity in days when the support of a church meant more than it does now, from a financial standpoint at least. After the organization of this church he was made superintendent of its Sunday school, a position he held for 17 years, and until old age forbade he was one of the deacons of the church. He and his wife early in life identified themselves with church and Sunday school work, also with the cause of temperance. In an early day, while still living in Jones county, they signed a pledge of total abstinence from intoxicants, and faithfully adhered to it all their lives. Mr. Homan is now living in the joy of a well spent life, and the hope of a glorious eternity. Time has been good to Mr. Homan, and left him the use of a sound mind, and some degree of health. He has a good appetite for food and enjoys the eating, but has not strength enough in his limbs to walk, and is unable to leave his room. He generally sleeps well and sits in his rocker most of the day. He is cheerful with the friends who call to see him, and greatly enjoys their visits. Mark Homan, father of the subject of this article, was a soldier of the war of 1812, and Lewis W. had two sons in the military service of the United States in the war for the preservation of the union. This Aged Lady Now Makes Her Home With Mrs. R.J. Bohanan in Corning, Iowa. 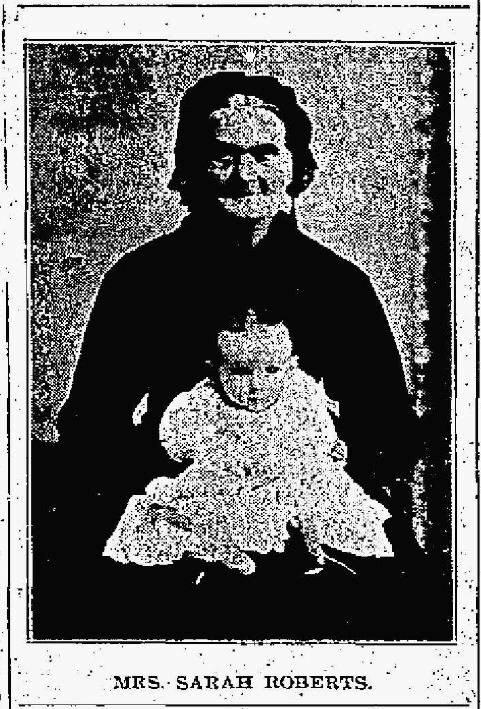 Mrs. Rebecca Ann Dillon, whose picture we present this week, was born in Guernsey county, Ohio, August 26, 1815, and is therefore about 93 and a half years of age. Her maiden name was Pulley. She resided in the county of her nativity for several years and on February 11, 1836, was married to James Dillon. In 1849, at the time of the gold excitement in California, her husband, in company with relatives and friends, went across the great plains to the golden state to seek his fortune. He was gone fifteen months and returned by water. 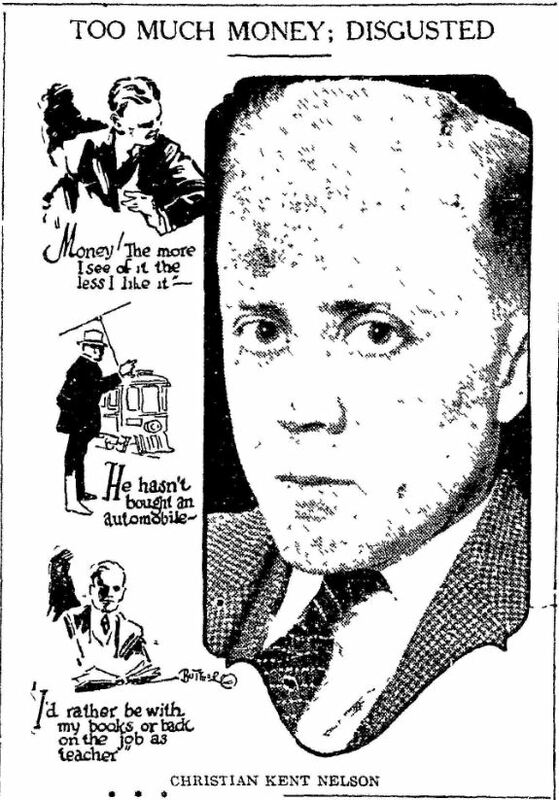 Mr. Dillon was more fortunate than any of the rest of his company, and returned with more gold than they. However, during his absence all the children of the family, five in number, had scarlet fever, and the eldest daughter died. Mrs. Dillon did not inform her husband of her trials during this absence, and he knew nothing of the death of his daughter until his return home. In the fall of the same year Mr. and Mrs. Dillon moved Grant county, Indiana, where they erected a house in the woods and cleared off the timber for a farm, a no small undertaking in those days, as the timber on the land in that vicinity was very heavy. On this farm they made their home and helped their children get a start in life. One son was born there. When not engaged with his duties on the farm, Mr. Dillon worked at the gunsmith trade. In the spring of 1872 he died, and Mrs. Dillon remained on the home place until 1874, when, in company with her two daughters and their families, she came to Adams county. 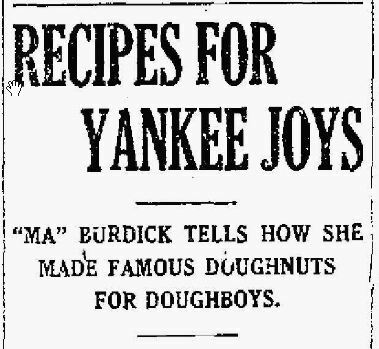 Her three sons were already here, and she made her home with her children until the daughters returned to Indiana, when she accompanied them, making her home mostly with her daughter, Mrs. Susan Veach. The latter died about two years ago, since which time Grandma Dillon has depended upon her grandchildren for care. Mrs. Dillon’s mental qualities are better than her physical strength, although she last fall made the trip from Hamlet, Indiana, to Corning unattended. Previous to the world’s fair in Chicago she made a visit to this city along, returning to her home alone in September of the same year. Even as late as last summer Mrs. Dillon visited with friends and relatives in Grant county, Indiana; but at present she has not the strength to walk alone, and is cared for by her grand-daughter, Mrs. R.J. Bohanan, of this city. Mrs. Dillon has three brothers living, Jonathan Pulley, of Chariton, Iowa; Jackson and Samuel Pulley, both living near Marion, Grant county, Ind. Two sons and one daughter are living. 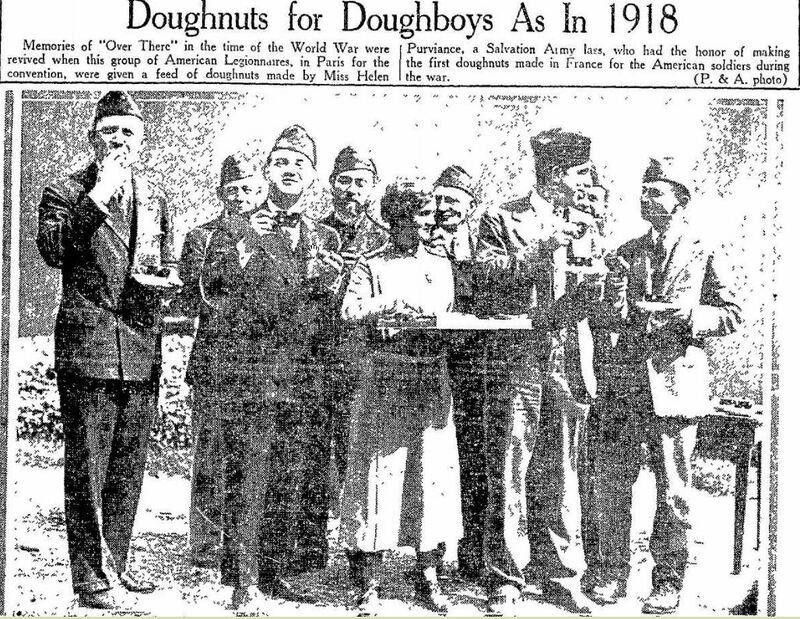 They are Mrs. Mollie Bowman, at the soldiers’ home in Lafayette, Indiana; Martin Dillon of Grant county, Indiana, and J.W. Dillon of Seattle, Washington state. Mrs. Rebecca Ann Dillon died at the home of her granddaughter, Mrs. J.A. 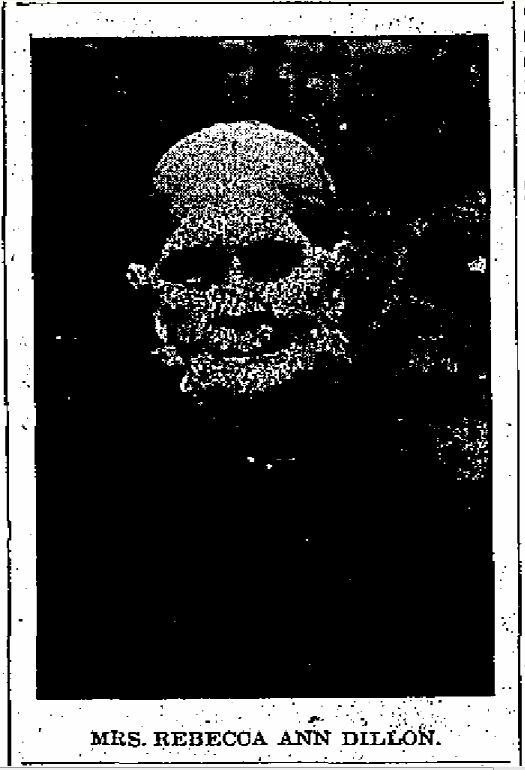 Bohanan, in Corning, on Saturday, October 7, 1911. Her death was due to old age, she being aged 96 years, 1 month and 11 days. To Mr. and Mrs. Dillon six children were born, three sons and three daughter. 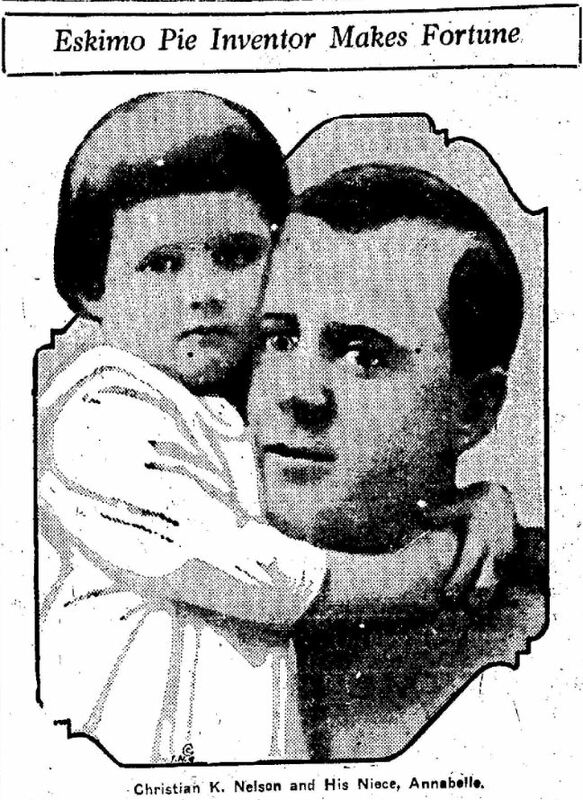 Mrs. Mollie Bowman and W.M. Dillon, both of Gas City, Ind., and J.W. Dillon, of Seattle, Wash., survive their parents, while Elizabeth Dillon, S.B. Dillon and Mrs. Susan Veach, preceded the parents in death. After the death of her youngest daughter Mrs. Dillon made her home with her granddaughters, spending some time with Mrs. Jennie Barker and Mrs. Ida Roose, of Hamlet, Indiana, and nearly three years with Mrs. Emma Bohanan in our city. Beside the children Mrs. Dillon is survived by one brother, Jonathan Pulley, of Chariton, Iowa, and a number of other relatives. She has had thirty-five grandchildren, most of whom are living; several great grandchldren and one great great grandson. Mrs. Dillon was devoted Christian, joining the church at the age of 14 years. She desired that she might pass from from this life as a candle going out and her wish was granted. The funeral services were held in the Christian church Monday afternoon, at 1:30 o’clock, conducted by Rev. J.C. Hanna, and the body was laid to rest in the First Baptist church cemetery, eight miles north of Corning. The relatives from out of town Mrs. Addie Williams and two children, of Greenfield; J.F. 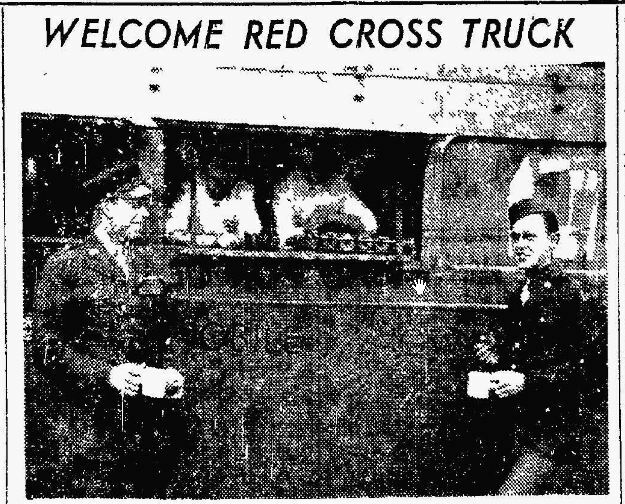 Dillon and Miss Ruth, of Carl, and other relatives met the funeral party at the cemetery. 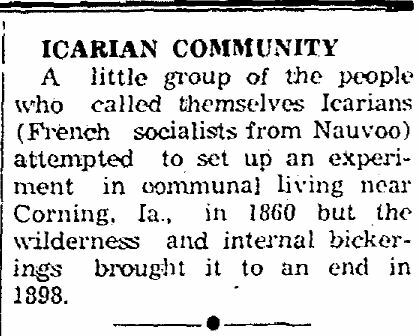 The failure of the Icarian community at Corning, in this state, only goes to show that it is powerful hard to invent a clevis with which a dozen families can pull evenly on one plow.